April 15, 2019, 1:40 PM · If we can, please, let's step aside from our narrow focus on theme parks to talk for a moment about the biggest story in travel and tourism around the world at the moment. One of the most famous tourist attractions in the world, the Cathedral features in countless productions well known to theme park fans, from Disney's Hunchback of Notre Dame to Epcot's "Impressions de France." The French Gothic landmark was built between 1163 and 1260, but the recent discovery of cracks in the stone walls prompted the start of renovation work, which was underway when the fire started today. Theme park fans might remember that it was a blaze sparked by construction work that destroyed the original King Kong attraction and other parts of the backlot at Universal Studios Hollywood in 2008. It's far too early to know what caused today's fire, but one hopes that at least some of the artifacts from the cathedral and its roof had been removed to safety before the renovation work began. The comes at the beginning of Holy Week, leading up to Easter this Sunday. 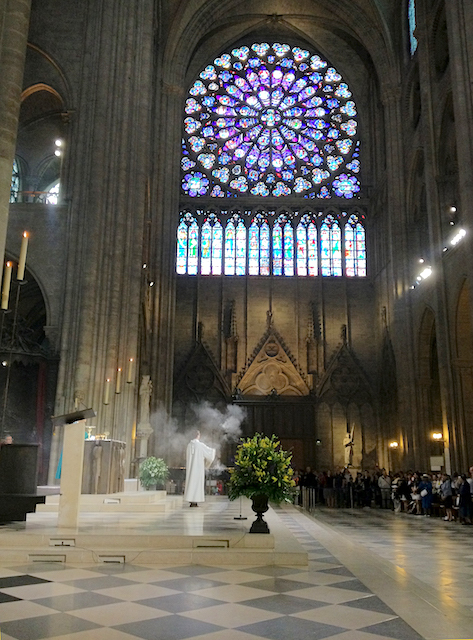 I visited the Cathedral during my family's first visit to Europe, in the summer of 2012. While my focus on that trip to Paris was Disneyland, of course, we set aside time to see many other sites in and around Paris, as well. All I can think to say right now is... if you have the means, go see things. Don't put off travel, because today teaches us that nothing lasts forever, not even cathedrals that have stood for nearly 800 years. Le Puy du Fou, the center of the living memory of France, wishes to take part in this national effort by organizing, on Friday, June 7, at 10:30 pm, an exceptional performance of the show "La Cinéscénie", for the benefit of reconstruction of this symbol of the French Legendary. All proceeds from this special evening will be donated to the national subscription requested by the President of the Republic. Update 2: The Walt Disney Company is now pledging US$5 million, too. Credit to Matthew Gottula for this observation. The spire atop Notre Dame that we lost today is reproduced (in scale) atop Disneyland's Sleeping Beauty Castle. This is just...wow. Over 750 years of war and upheaval and now ending like this. Just a huge loss for historians and culture alike and a true tragedy to realize you're not going to be able to see it again outside of photographs and video. I'm fairly sure we'll see it again. Maybe not in my lifetime, but my children and grandchildren will get to tour the new Notre Dame cathedral one day. Luckily, I got to visit Notre Dame for a few hours about a year ago. The profile picture was taken then (and it was added to my profile about a week ago). Without meaning to trivialise the event, it was just the roof and spire which was destroyed, so yes, people will still be able to see Notre Dame, albeit not in its original and complete form. Swinging it around to a theme park association to today's tragedy, a CM friend of mine sent me a text regarding tonight's firework show at the Magic Kingdom: "During the fireworks show at the Magic Kingdom there is a portion where they turn the castle into the Notre Dame Cathedral where They launch fireworks FROM THE CASTLE. What shortly follows is Moanas segment where it starts with it having flashes to simulate a burning fire behind the castle and Later they project it so the castle is on fire." No life lost, it's just a building. It may be "just a building", but for history this is the equivalent of losing Big Ben, Buckingham Palace, the Roman Colosseum or even the Pyramids... Losing that much history in a world full of so many short attention spans is just sad. I've never been there and don't even have that much appreciation for French culture, but it still feels like a great loss to me. Having been fortunate enough to personally see bits of history like the Pyramids and a 3rd century English castle, I can only echo Robert's words... Go see things if you can. Theme parks are great, but there is REAL beauty and wonder in this world that could be gone in an instant. Thankfully, it sounds like it's not the massive loss so many feared. The spire is gone and interior damaged but it seems much of the building has been saved so while horrible still, it could have been much worse. Adding to Mike W's post, from The Independent: "Sixteen statues that were part of Notre Dame’s now destroyed spire are safe and unscathed after removed as part of a renovation just days ago. In one of the ironies surrounding the damage and destruction inflicted on the 12th Century cathedral, 16 green-grey statues representing the 12 apostles and 4 evangelists, were lowered by cranes from the site, now threatened by huge flames, and taken away." I kinda want to be snarky and say Big Ben is Just a bell and the building it’s in is a much more impressive sight, however I’d actually like to draw attention to the fact that “The Queen Elizabeth Clock tower at the Palace of Westminster” of which Big Ben resides in) is actually under threat. The “Mother of Parliaments” is sadly falling to bits. Long delayed maintenance, exposed wiring, old pipes and other issues mean there are now 24 hour patrols of the building simply looking for the possibility of fire. Parliament has been reluctant to deal with it partly due to the cost (it’s going to be very high) and partly because the entire complex will need to be completely closed for years. So, I’d like to sign off with a hope that we’ll all put a bit more thought and money into protecting our cultural heritage... and to agree with Robert come see it while you know you can - it’s just down the river from what some claim is the worlds oldest theme Park (The Tower of London). To be fair the history of the cathedral isn't very glamorous. It has been a hospital, a stable, a warehouse and more. The French only recovered it's tourism value the past few hundred year. And that spire atop Notre Dame was a later addition and not even original for the building. In the end it's a nice building, build by blood and oppression of the poor in glory for the 1%, run by a failing institute riddled in scandals who don't seem to have an end. It's a nice building and I'm sure it will be repaired. No lives where lost, everything is fine. Actually the building isn't owned by the Catholic Church. Like all churches in France since 1905 it has been owned by the State who have massively under-funded it and are largely responsible for the terrible state it had allowed to get into. They have ignored warnings that it was in danger and last year Macron refused permission to levy an entrance charge which would have raised the millions needed to maintain it properly. This is a state owned asset of international architectural importance and the blame has to lie fairly and squarely at the feet of the French government. Although I do lament the loss of culture and history, I have to admit I was never really interested in seeing Notre Dame. For me Sagrada Familia, or Christ the Saviour in Moscow are more impressive. Has there been any word on whether or not their football team will still be able to play the season in their snazzy gold helmets? Daniel Galvan, those churches in Moscow and Barcelona might appear more impressive to you, but they were not built by master artisans using revolutionary techniques during the middle ages. Disney officially donating US$5 million to rebuilding Notre Dame Cathedral. Have a hunch Quasimodo is pleased with this.